While last weekend brought a memorable performance from one example of those most modern of musician collectives, the percussion quartet, this coming weekend has me thinking of another. With the explosion of music written for an ever-increasing array of percussion instruments both foreign and domestic, ensembles of percussionists have increasingly struck out on their own, commissioning new works from composers happy to do so and building careers out of playing them together. Perhaps the most prominent of these ensembles on the West Coast is the Los Angeles Percussion Quartet, which is now entering its fifth season with its original line up of Matt Cook, Justin DeHart, Nick Terry, and Eric Guinivan. The group has played 20th and 21st-century works on most of the major stages around town but they passed a new landmark recently with the release of their first major label recording on Sono Luminus entitled, Rūpa-khandha. The recording is notable for many reasons, but first and foremost because it is focused heavily on the legacy that West Coast composers have left on the percussionists' art. Ensembles like Brooklyn’s So Percussion have made a name for themselves commissioning works from the likes of New York-based composers Steve Reich and David Lang. 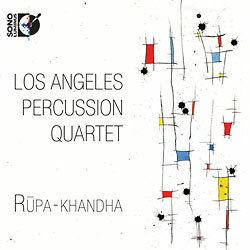 And while the LAPQ are no strangers to this work, the material on Rūpa-khandha is decidedly different, featuring four newly commissioned works from composers working on the West Coast with an eye toward the percussion legacy left by those California giants of 20th-century composition Harrison, Riley, Harry Partch, William Kraft, and others. One of those legacies is an interest in Eastern percussion instruments and their use in religious and folk settings. The first two pieces on Rūpa-khandha refer to those elements in direct if not always specific ways. LAPQ member Eric Guinivan’s Ritual Dances imagines music for folk rites of some imaginary tribe of the Pacific Rim. African and Arabic drums are joined by “found instruments” over five movements that emphasize the ritualistic sounds of ceremonies both solemn and celebratory. This is immediately followed by a similar companion piece from Sean Heim, Rūpa-khandha. The title refers to the first of Five Aggregates or “khandras” that constitute the human being in Buddhist philosophy. The allusions in this single movement are taken from a variety of other cultural traditions including the notion of the five basic elements and Native American musical traditions. The music evokes a sense of spirituality separate from the kind of urban transcendentalism common among works coming out of the late 20th century school of American Minimalism. The Los Angeles Philharmonic’s current Principal Timpanist and composer Joseph Pereira follows suit with Repoussé, four movements inspired by his travels and instrument collecting while still playing with the New York Philharmonic. The title here, and those of the four separate movements refer to techniques of production in visual arts. Repoussé specifically refers to hammering out low-raised decorative embellishments in a malleable metal. It's an intriguing piece and it speaks to Perira's increasingly higher profile in this region as a composer. The recording concludes with a single movement from Jeffrey Holmes, Occasus.